Simplify Control of Multiple AJA Ki Pro Units in Production Environments. HRS KP Automation and the next-level HRS KP Automation PRO are dedicated Mac OSX applications that provide simple, easy control of multiple Ki Pro units. These two solutions offer automated control to AJA’s popular Ki Pro family of file-based recorder/players including Ki Pro, Ki Pro Mini, Ki Pro Rack, Ki Pro Quad and Ki Pro Ultra. HRS KP Automation is a base-level product offering all the features and functionality that most Ki Pro users require and supports Ki Pro, Ki Pro Rack, Ki Pro Quad, Ki Pro Mini and Ki Pro Ultra. With KP Automation you can execute gang playback and record, download clips and do file transfers to your local Mac or network hard drive for back up. The app also displays current time code, current clip name and shows the progress of clip downloads as well as proving users a range of additional status information for each Ki Pro. It also permits scheduling of recording, playback and downloads. HRS KP Automation PRO includes all the features of HRS KP Automation and more. gives you the ability to upload clips from a network or local computer and to transfer clips from Ki Pro to Ki Pro. In addition, it enables users to store hot keys on the fly for any Ki Pro product that load a clip and jump to time code – a playback utility that people with more demanding live productions, such as sports replays, are looking for. The apps’ clean and clear interface design looks and feels familiar to users of AJA Ki Pro products. The layout features two columns. 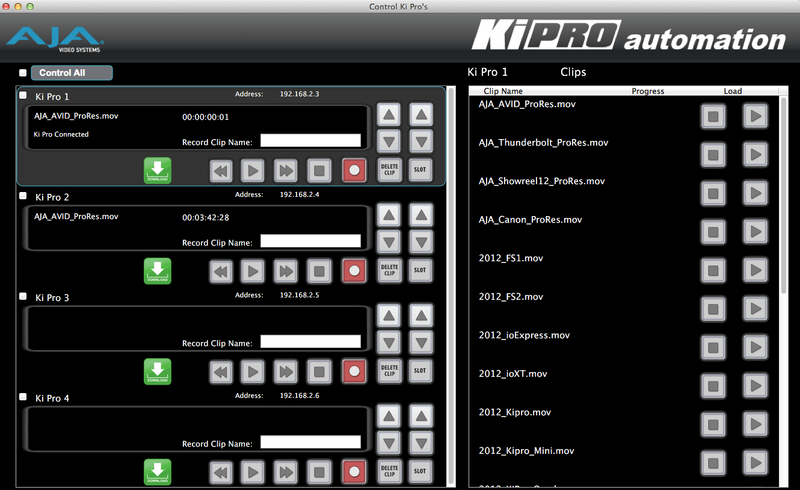 The left-hand column features buttons for transport commands and a download button for each Ki Pro unit. The right-hand column always shows clips on the selected Ki Pro; downloading is tracked with a progress bar. Selecting more than one Ki Pro unit for control triggers gang control with easy one-button execution.